A seventeen-year old Palestinian allegedly carried out a stabbing attack in Geva Binyamin (Adam) Israeli colony, in the Occupied West Bank, killing one Israeli and wounding two others before he himself was killed by an armed paramilitary Israeli settler. Update: 8:40 AM: Israeli daily Haaretz has reported that the slain Israeli settler has been identified as Yotam Ovadia, 31, and added that Yotam succumbed to stab wounds. On its part, the “Times Of Israel” said Ovadia, a father a child, 2 years of age, and a 7-month-old infant, worked as a technician with “Brinks Security Company”. 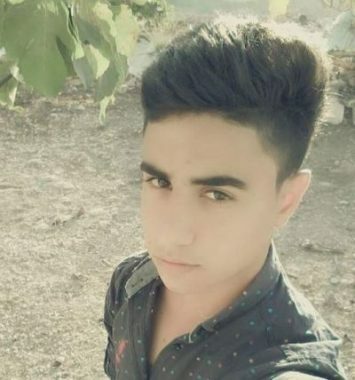 The Palestinian, identified as Mohammad Tareq dar Yousef, 17, allegedly managed to climb over the fence into the illegal Israeli settlement of “Adam”, which had been built on stolen Palestinian land which was taken from his village, Kobar, near Ramallah. He then stabbed three people before he was shot and killed. A 31-year old Israeli colonial settler was killed, but he has not yet been identified. Another unnamed Israeli settler, age 50, is in critical condition with stab wounds to the upper body, according to Israeli media sources. Dozens of soldiers in armored vehicles surrounded and invaded Kobar, near Ramallah, in the hours following this incident. Protests broke out in the village, and some teens threw stones at the invading soldiers. The troops invaded Mohammad’s home, surrounding it and demanding that the family leave. It is unknown at the time of this report if the soldiers are planning to carry out a punitive demolition of the alleged assailant’s home, but this is a known and common practice by the Israeli military. Over the past hundred days, Palestinians have been engaging in largely non-violent protests on a weekly basis in Gaza as part of the ‘Great March of Return’, calling for a return of the Palestinian refugees to their homes in what is now Israel, and an end to the siege on Gaza that has strangled the economy of the tiny coastal strip since 2007. Israeli forces have killed nearly 150 Palestinian demonstrators during this time, and wounded more than 17,000, many with live ammunition. 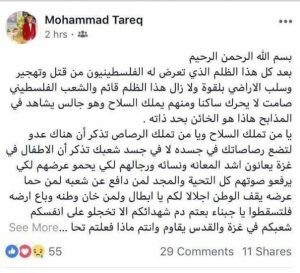 One Israeli was killed in this time period, in May, by a stone slab that fell on him from a building in a Palestinian town he was invading in the West Bank. The Palestinian resistance in Gaza has held its fire in solidarity with the non-violent demonstrators, but this past Friday a firefight broke out and an Israeli soldier and four Palestinian fighters were killed.